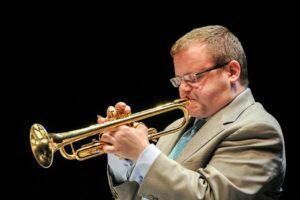 Ryan Kisor was born on April 12, 1973 in Sioux City, Iowa, and began playing trumpet at age four. In 1990 he won first prize at the Thelonious Monk Institute’s first annual Louis Armstrong Trumpet Competition. Mitch Towne is a keyboardist and touring musician, and is widely considered as the “go-to” Hammond organist in the Midwest. His ability to move seamlessly between diverse styles has made him a sought-after side-man with artists as varied as jazz/R&B artist and Grammy-winning producer Terrace Martin, jazz heavyweights Ryan Kisor, Dave Stryker and Adam Larson, blues artists Eric Gales and Ben Poole, and multi-platinum artist Aloe Blacc. In 2015, Towne played organ on the track “Push” for the album “Velvet Portraits” by Terrace Martin, which was nominated for a 2016 Grammy for “Best R&B” album.